Bella is just one of the lucky grizzlies living at Montana Grizzly Encounter, an educational rescue center. Naturalist Casey Anderson makes sure she feels right at home. National Geographic host and filmmaker Casey Anderson knows the power of bear cub cute, because he recently rescued a cute little orphaned cub named Bella and can't stop playing with the adorable cub! Bella isn't Casey's first encounter with a cute bear cub- he adopted a cub called Brutus about ten years ago and formed an incredible friendship with the bear that inspired him to start the Montana Grizzly Encounter sanctuary. Montana Grizzly Encounter; a Grizzly Bear Rescue & Education Sanctuary in Bozeman, Montana. Founded in 2004, MGE provides a spacious and natural home for rescued grizzlies. At the same time it offers the public a place to come and learn about grizzly bears as they watch the majestic animals “up close” in a beautiful mountain setting. All of bears were born in unfortunate captive situations and could NEVER be released into the wild. 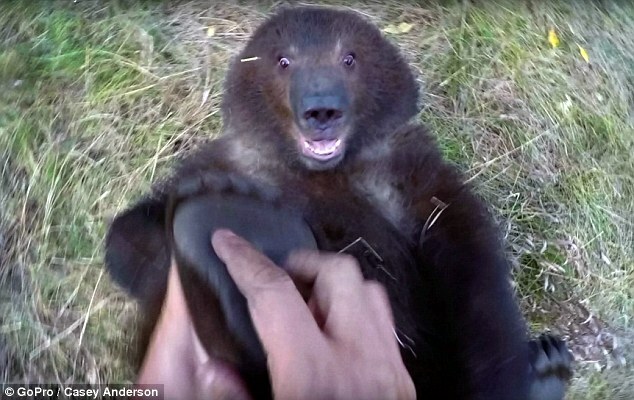 Responses to " Orphaned grizzly bear develops heartwarming bond with man who saved her"
Bella is much bigger now and still as adorable!